We have been in India for 1 month now, and it has certainly been an eye opener to both of us! We have seen some beautiful, amazing and also disturbing things, as we have travelled through India. One month here is not enough to grasp the fullness of the Indian Culture, however for us we feel we are ready to move on! Arriving in New Delhi was one of the toughest travel experiences we have ever had to go through. That is not surprising though, considering neither of us have ever set foot into Asia before. When you arrive in a place like Delhi, you are leaving behind all your home comforts and you are entering a place that you know little about. You are curious about what people think of you and the locals are very curious about you. At the beginning we were confused about why people wanted our photo so much. Every time we would walk down the street, a local would ask if they could have our photo. Some children would even just want us to take a photo of them. Although I do not fully understand this, it has become a little more clear to me now. In India you are seen as a millionaire if you have a camera, lap top, ipod ect. So it is not surprising when they see us with our cameras, to be fascinated with us. Of Course we are not rich, as far as English standards go, but to them we are! Also the Indian Culture is not as diverse as our own. Most of the time, when we were out in public, we were the only white people in sight. So people would stop and stare. At first I found this amusing, but in the end it gets a bit tiring. Sometimes you just want to go out and not be stared at. There are some simple ways to blend in a little, for example cover up as a sign of respect. Indians take modesty very seriously, and it is respectful to cover shoulders and legs, whilst in public. As much as you try to blend in however, one thing you can’t change is the colour of your skin! So be prepared to be starred at whilst you are in India. India is such a big country and an easy mistake to make, is to rush through the country, without taking time to appreciate the things around you. I would suggest if you only have a short time in India, then it would be better to see less places, than to rush through places, and in the end just wear yourself out. A great way to travel, is by train. We had no problem with the trains at all. They are comfortable and very cheap! It allows you to see the landscape in the country and it is a very interesting way of travelling. You also get to meet a lot of other travellers and it gives you a chance to speak with locals. We really enjoyed our time in Goa as it gave us time to relax and slow down for a while. However if we had only gone to Goa, we wouldn’t of seen the true Indian Culture that a lot of tourists miss by just going to Goa. Even though Delhi was tiring and hard work at times, looking back we realise just what an experience that was. The madness of the place is what made the experience worth while. Walking down the street with goats, cows, pigs and monkeys, is not something you see every day, not to mention seeing a boy with a monkey tied to a string, hoping to make some money from it! People really do what they can here, to make money for themselves, and you have to respect them for that! I was fascinated to see men on the street with weighing scales, taking money to weigh people. Also it was not uncommon to see people getting there hair cut on the side of the street, or men getting a shave on the street. We will always look back at our time in India as a time of learning! It has given us a glimpse at a culture that is so different from our own. It has also made us appreciate the things we had at home, but didn’t really appreciate enough at the time! Things like having a home, clean water, a job, safe roads, laws and not to mention our family and friends. You certainly learn to appreciate these things a little more, when you realise how many people here are without homes! There are so many children pleading for food and money, and it is hard to say no, but it is impossible to help everyone! Whilst we are overeating and chucking food in the bin, people here are starving. I couldn’t pin point what my favourite place has been as such, as every place has been completely different! For relaxation I would say Goa, it is a beautiful, laid back place. It is very tourist friendly, in fact so much, that sometimes it is hard to meet locals! Everything has been an experience, some good, some bad, but all of which I’m glad we went through! We will be leaving for the airport shortly. We arrive in Singapore 6 pm, their local time. We plan to stay there for about 5 days, then head to Indonesia. I will keep you all posted! We arrived in Chennai yesterday morning after a 22 hour train journey from Margao, Goa to Chennai Central. The train journey was a really pretty journey, we passed many beautiful mountains and waterfalls. Arriving in Chennai was quite stressful as any city can be. As soon as we got off the train we were back to being bombarded by rickshaw drivers. All trying to get commission for directing us to a hotel. We finally found a hotel for the night. It was fairly clean and comfortable, the only downside is that we had to spend a good 1/2 hour killing cockroaches, before going to sleep. We are glad we are now out of that place, and staying in a brand new hotel, that only opened this week. Today we visited different temples. 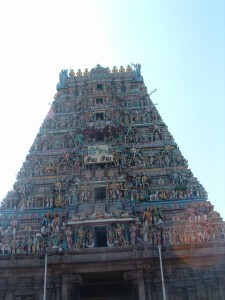 We went to see the famous Kapaleeswarar Temple, which is a Shiva Temple, located in Mylapore, Chennai. We also visited Santhome Cathedral Basilica, which is a Christian church. The name of Santhome Cathedral Basilica was derived from the name St. Thomas who is an archbishop of the Catholic Christians. 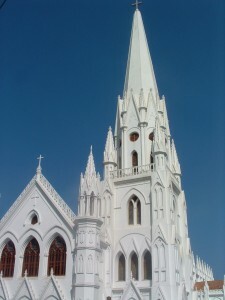 St. Thomas who is a hard-core devotee of Jesus Christ was buried in this place and as a tribute to his soul a church has been built up in this southern part of Marina beach. We will post more later.